This is my second post today. Scroll down for my nautical card. 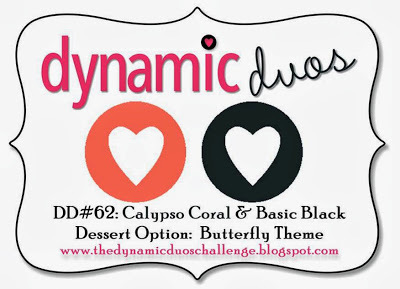 It's also my second card for this week's color challenge at Dynamic Duos, which is Calypso Coral and Basic Black, with a dessert option of butterflies. When I thought of butterflies as a dessert option, the phrase "with a side of butterflies" popped into my head and now I can't get it out - hence the title of this post! 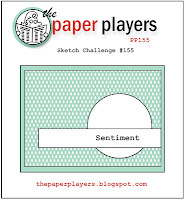 I used the sketch at Paper Players which is a lovely CAS sketch, using one of my favorite card elements - a circle. I again used the delicious Modern Medley DSP and this time used it with a new-to-me stamp from Papertrey Ink. I have to say, though, that it really, really bugs me that the panels on the newsprint DSP are not printed straight. I checked both sheets in the pack and they are both the same. Great use of the sketch, Karen! I like how the sentiment takes center stage and the addition of the baker's twine is so sweet! Thank you for joining us at The Paper Players! Love your take on the sketch, especially with the striking black background! LOL, it would bug me too about the print not being straight! I would have to trim it to make it so! Anyway, paired with the Coral butterflies, it all looks wonderful! Thanks for playing with the Players and sharing your creation! Great combination of newsprint and sheet music dsp. Very pretty card! Thanks for playing along with us this week at Dynamic Duos! Wonderful job on both challenges and such a lovely way to showcase those beautiful DSPs!!! Thanks so much for playing along with us at Dynamic Duos this week, we sure hope to see you back again soon! This is a pure delight, Karren! I smell a winner! !